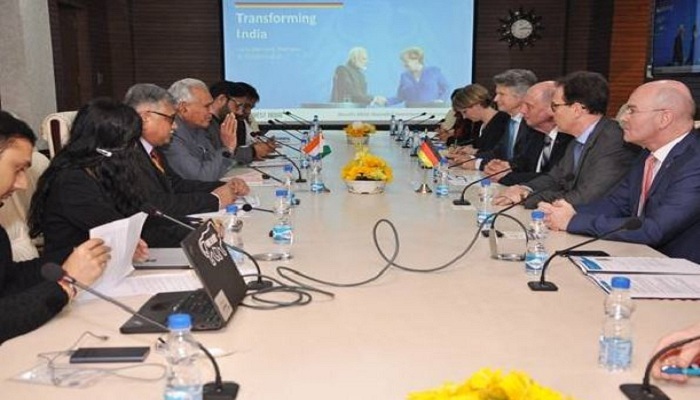 Union Minister of State for Commerce and Industry, C R Chaudhary, held a meeting in New Delhi yesterday with a German delegation led by Dr.Wolfgang Tiefensee, Minister of Economic Affairs, Science and Digital Society of the State of Thuringia, Germany. C R Chaudhary emphasised the need for further economic cooperation between India and Germany. He apprised the delegation that the Government of India is continuously working to create a conducive atmosphere for foreign investments in the country. He pointed out that because of the continuous efforts and commitment of the Government, India has moved from 142 positions to the 77th position in Ease of Doing Business ranking in the world. Minister C R Chaudhary sought German investments, particularly in the field of food processing, development of infrastructure for 100 smart cities, pharmaceuticals, automobile and engineering sectors. He also sought all round support of the German Government for investment, guidance and exchange of best practices for the Start-ups in India. Cooperation in the field of education as well as in Research and Development was also discussed during the meeting. The meeting was organised by Invest India.